All weekend I’ve been partying with the grown folks, but I should revise that term, because in reality the party people were of mixed ages. There were some in their 20s and 30s and then there were also the veterans. The group I’m talking about – NYMLA, or the New York Music Lovers of America, Inc.
Hopeton Lewis, who received the Howard Philbert Award. In the background of the photo are awardee Tony Ryan and NYMLA board member Ray Lawrence. This past Memorial weekend I had the pleasure of attending a series of events, designed to highlight and reward that certain breed of music lover – the music collectors. They came from as far afield as Jamaica and Toronto to converge in New York for a fun-filled weekend connecting with new friends, reconnecting with old, eating and drinking in pleasant surroundings and of course reveling in the highlight of each event – the music. Friday evening saw me driving with my weekend companion, my mum and a girlfriend to the Long Island Yacht Club. After getting lost a few times, we finally found our destination and what a change from the dusty inner city streets of NYC, right on the water’s edge, speed boats and yachts bobbing gently on the glistening silky smooth waters of the Sound. Tents lined the pier as a few people relaxed in the cool evening. The venue was very classy with that understated ambiance that comes from old money. On entering the ballroom, we were greeted by scores of music lovers and their supporters, while at the turntables, collectors delighted the crowd with “shots” – samples of rare groove or obscure and highly prized original versions of music. As I looked across the room there was a predominantly male crowd huddled around the turntables, faces shining in anticipation, awaiting the next drop. They showed their appreciation by reaching over and ‘rewinding’ any song that merited that action. I did indeed hear some very rare recordings that night – one in particular whipped the crowd into a frenzy – “I feel so at home” by Michelle Wylie. The tone of the evening was set as one after the other, the selectors tried to outdo each other. Collectors in attendance who shared their treasured music included Ray Lawrence, Norman “Buzz” Fortella, Phillip Howell from Jamaica, Noel “Maxie” Henry from Canada and Jimmy from Detroit. It was so nice to feel the love in the room, as with one accord the attendees came to pay homage at the shrine of good music. Roy “Buck” Buckley from Moodies and Jah Wise, venerable selectors, were also in attendance, savoring the sweet sounds. The next event was scheduled for Saturday morning at Mystique, a local Bronx watering hole which was to host the record collectors fare and jazz brunch. My companion had a prior engagement so we skipped that event and rested up for the evening’s offering, titled Reggae to Soca at The Occasions Banqueting Hall in Queens. Saturday night has long been established as a party night and this night was absolutely no exception. Discs were seamlessly spun by the DJs for the night – DJ Supa ‘Fridge, DJ Dwayne, DJ Baby Q and from Trinidad – Teddy Mohammed. We danced oh boy how we danced, it was one of those occasions where you had such a surfeit of great music that even though my feet were crying out in protest, I had to head back to the dance floor time and time again. We staggered home in the wee hours of the morning having thoroughly enjoyed ourselves. Sunday was the highlight of the weekend with the banquet and awards ceremony held at The Courtyard Marriott Hotel in Queens. Patrons dressed in their finery befitting the occasion dined on salmon and chicken in a tastefully decorated dining room. Artwell “Monty” Campbell and Tony Ryan of Tony Ryan Music & Health in the Bronx were both awarded The 2010 Spencer Tracey Lifetime Award; Evadney McKay owner of Mystique Nightclub in the Bronx received the 2010 Spencer Tracy Humanitarian Award for making her establishment available every second Sunday for the NYMLA crowd to gather and socialize. 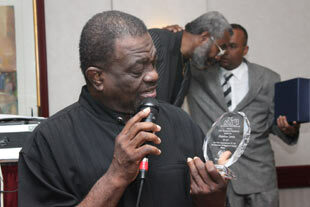 The Howard Philbert Award was humbly received by Hopeton Lewis who delighted fans with a live selection of some of his popular songs. The organizers of NYMLA provided a great entertainment. I can’t wait for the next event.